Last night we had a doozie of a thunderstorm come through. It woke us all up, and of course if I wake up in the middle of the night, I immediately have to go to the bathroom. Tassie, like many other dogs, doesn't like thunderstorms. However, unlike most other dogs, she doesn't try to hide or destroy things or even whine. She just sits and trembles. It really is the saddest thing you'll ever see. When I went to the bathroom last night she followed me so she could sit on my feet, lean up against my legs, and resume trembling. Tassie says, "Aww, man! 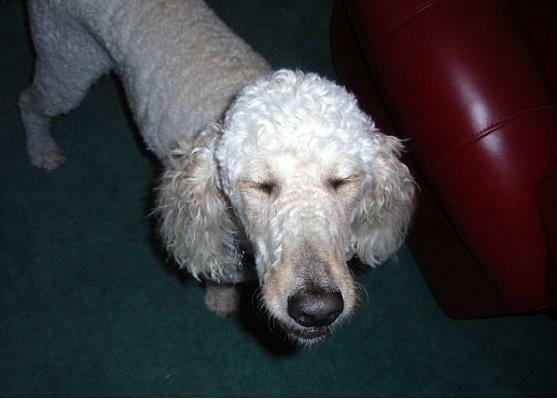 I blinked!" We had another storm come through this evening so I got see her trembling in action. I really don't know what I'm supposed to do for this. Must google. Anyways, just as I was sitting down to eat some pasta, Marty called to have me come pick him up as he was stuck at a gas station not wanting to ride home in the deluge and cracks of lightening all around. And like the good wifey that I am, I went and got him. And felt bad for all the cyclists I saw on the roads heading back to either Inside Out or Cycling Spoken Here. It was truly dangerous out there. I took Tassie with me because I didn't want to leave her home alone all trembly, so she shook in the car with me instead. Poor Tassie. Frito sends his sympathies. Poor Tassie. Roxy does that too - just shakes all over and gives you this pathetic look like "save me!" Breaks my heart!! We need to move somewhere where there are no storms!! So sorry Tassie was scared.. Give her a hug and it will be over soon! You are both a good wife and a good dog mom since you brought Tassie with you. Our dog Snoopy is not a fan of thunderstorms either, but the other 3 dogs don't really care. You know how Amy is - gets on the couch and won't stop until you cover her with a blanket. Jackson stands at the glass door and barks to go OUTSIDE in all of that mess! It really is a good thing he is cute, because smart is not a word associated with that dog!